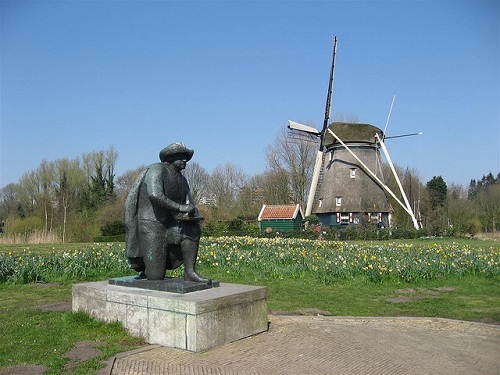 De Gooyer is the windmill closest to the city centre. It was built in 1725. It was once used as a flour and corn mill. It is a beautiful preserved example of a 17th century windmill. Unfortunately De Gooyer is not open to the public. Fortunately right next to the mill is the famous brewery and cafe Brouwerij ‘t IJ. This is one of the most popular bars in Amsterdam. It also offers guided tours in the brewery. They serve their own beers and everything is organic. The Moulin de Gooyer is a great experience. De Gooyer windmill and Brouwerij ‘t IJ are located near the Entrepot Kadijken. It’s about 25 minutes walking from Central Station, where you will pass the NEMO Science Center and the Martime Museum. It’s a nice walk past the docked in waters of the IJ river. The Molen van Sloten is the only one of all Amsterdam mills that’s open to the public on a regular basis. It is quite far from the city centre, but it’s worth the trip. The Molen van Sloten windmill is not the only attraction in this area. You can also visit Het Kuiperijmuseum (“Barrel Makers Museum”) and the 1000 years old village of Sloten. The mill itself was built in 1991, the top of the mill was built in 1847. This is why, even though its quite new for Dutch standards, the mill still has an historical feel to it. The main part is more than 160 years old. On the attic of the mill you will find an exhibition of Rembrandt’s main characters in wax. 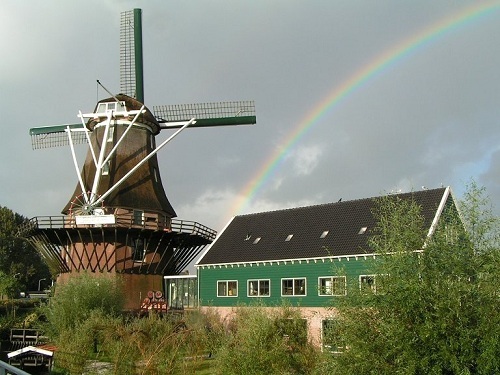 The Molen van Sloten opens everyday at 10:00 am. There is an elevator inside. The museum is also worth a visit. It showcases how barrels were built. This was an enormous industry dating back to medieval times. The village of Sloten has a very nice historical centre. At the end there is the famous pole from 1794 which was used as the border of Amsterdam. Bandits were not allowed to go past the pole. 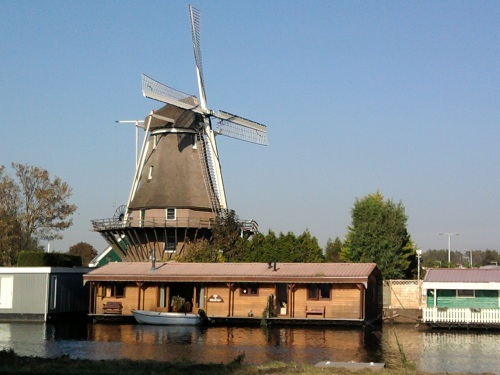 These attractions are located on the ringvaart near Badhoevedorp. You can take tram 2 from central station all the way to the end, then its a 10 minute walk. You can also take bus 192 or 145. Other Amsterdam mills include De Otter (“The Otter”) located in Amsterdam’s westside at the Kostverlorenvaart. This is a very old sawmill, unfortunately not open to the public. It is the last remainder of a local industry in that part of Amsterdam. De Otter is a 10 minute walk west from the Jordaan. 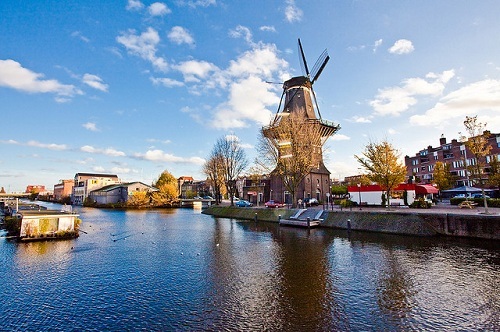 In Amsterdam’s Northside you will find the D’Admiraal windmill. It is the last remaining chalk mill in the Netherlands. It is located on the Noordhollandschkanaaldijk, which is quite far from the ferry to Central Station. If you are a mill enthousiast its definitely worth a go, take bus 36 at the ferry’s north side. De Bloem is a large mill in Amsterdam’s westside. It’s a 20 minute drive from Central Station. De Bloem still functions as corn mill.